Bills introduced in the House and Senate are calling for dome-shaped coins in gold, silver and clad to commemorative the 60th anniversary of the Naismith Memorial Basketball Hall of Fame (www.hoophall.com). Congressman Richard Neal (D-MA) introduced the House version, H.R.4592, on Tuesday, Feb. 23. Senator Elizabeth Warren (D-MA) brought forward the Senate version, S.2598, two days later on Thursday, Feb. 25. "These unique dome-shaped coins that would come at no expense to the taxpayer is the ideal symbol for the first and only museum that honors the sport on all levels around the world," Rep. Neal said on his Facebook page. "What began as a simple game in a gym has transformed into a worldwide sensation that attracts millions of spectators every day." 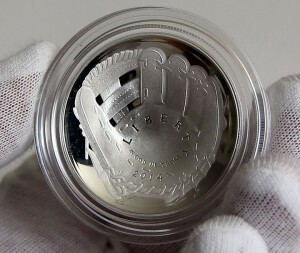 These coins would be minted in collector qualities of proof and uncirculated and feature curved shapes similar to the 2014 Baseball Hall of Fame Commemorative Coins. Under the terms of both bills, a surcharge of $35 per gold coin, $10 per silver dollar and $5 per clad half-dollar would be added to each coin sale. Collected surcharges would fund an endowment to enable the further operations of the Naismith Memorial Basketball Hall of Fame. Thanks for this news, Mike! I Agree, Tinto! Great News, Mike! 2019 seems like a long way off, but the time will Fly! And so will these basketball coins, the Day they are ultimately Released! And I, for one, can hardly wait!!! Any new developments on the Apollo 11 50th Anniversary coins you reported on last June? Would it be overkill to have both commemorative issues for the year to rely on the same gimmick? I thought it was a great idea for America’s pastime and Naismith did invent the current game though I do remember seeing a similar ball in hoop court used for the ancient Greek games (yeah, I’m almost old enough to have been there) but now I have the feeling of “been there, done that” and not much excitement for another convex/concave commemorative coin. Maybe I’ll feel different in another 3 years but for right now, meh. The Apollo 11 50th anniversary commemorative curved 3-coin program legislation has not moved one bit since the day it was introduced in the U.S. House of Representatives in June 2015 & there seems to be no similar legislation in the Senate yet surprisingly. This subject matter is certainly one of the most significant milestones in USA history! Hopefully it will move on up soon on the legislative calendar. With all of the other truly worthy things yhis country could honor, do we really need a coin to commemerate a multi-billion dollar corporation? Let the NBA fund their own tribute to themselves. Honoring the MLB and NBA (I’m sure the NFL which seems to be hurting for money will be getting a coin soon) has the same stench about it as the coin programs of the 30’s. The US commemerative coin program is off track and needs to end. I’ll go with another slogan on a coin to be issued this year: just say no. Seriously it’s too soon after the BHOF coins to have an identical set of curved coins. They’re far too gimmicky and the 50th anniversary of the Apollo 11 moon landing in 2019 is vastly more important a milestone to miss than the Naismith achievement. For the latter perhaps in 2041 or 2044. You both have it right on point! People like you have my vote to serve on the U.S. Mint’s Citizens Coinage Advisory Committee. Great comments on the sometimes crazy coin design concepts/subject matter we get in recent years. I’m in complete agreement. As Rocky might say: Yo, Mint! Enough awready! The Royal Canadian Mint announced in their latest mail out that a special domed shaped colourized coin will be released to commemorate the 125th anniversary of the sport.